NEW YORK, NEW YORK: January 18, 2017: LA PERLA is pleased to introduce the Corset Jacket, a key suiting concept from the new ready-to-wear collection designed by Julia Haart, Creative Director of LA PERLA. The Corset Jacket makes its worldwide debut in a striking photo of Kendall Jenner. The LA PERLA Corset Jacket represents Julia Haart’s vision to fuse LA PERLA’s unparalleled knowledge of the female form with a unprecedented devotion to how women want to feel: sensual, beautiful and comfortable — an offering only LA PERLA can provide. 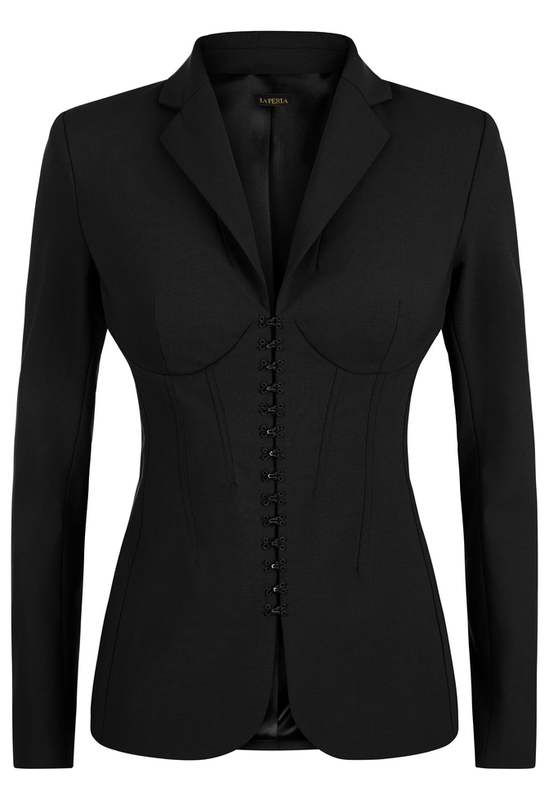 From boardroom to evening, the Corset Jacket translates seamlessly into every area of a woman’s life. The single layer of structured bi-stretch wool against the skin gently enhances the female form, while never sacrificing total comfort.